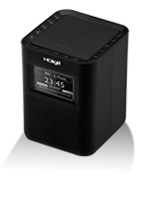 Fii Clock by HDigit is THE perfect piece of equipment for any radio fan: This state-of-the-art radio alarm clock receives DAB+ and DAB as well as VHF radio stations. You can choose from thousands of Internet radio stations and podcasts via the Wi-Fi connection and even stream your favorite songs directly from your computer. Thanks to its alarm function, this device features a fashionable design and is also a reliable, multi-functional alarm clock. HDigit Fii-Touch is a sophisticated digital radio in a fashionable design with innovative touch functions that replace classic buttons. A simple light touch to the surface let you enjoy the excellent sound. 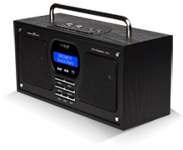 The DAB/DAB+ radio allow you to receive digital radio in a sound quality with no interference of any kind. 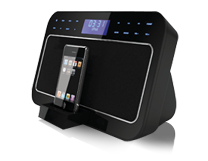 The integrated iPod docking station opens when needed by pressing slightly on the tray. Place your iPod into the tray and enjoy your favorite songs! 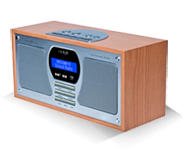 The Fii Classic – A modern digital radio in a classic design that is easy to operate. The Fii Classic - The radio of a different kind. This digital radio is designed without any of those unnecessary added functions and as a result offers pure radio pleasure. This makes it especially easy to operate and the perfect radio for the whole family. Especially the older generation that often has a hard time using complicated equipment will greatly appreciate just how easy this radio is to use. What‘s so extraordinary about this radio, however, is its design, because the latest technology is not enclosed in plastic, but instead in a classic wood housing.